I love to experiment with recipes to come up with new twists. This one is just that. 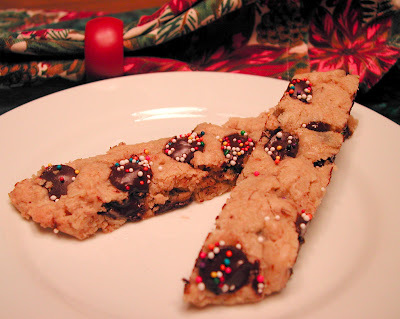 I have an Oatmeal Chocolate Chip Biscotti recipe that I make every holiday that everyone loves. So why change it, you ask? Because I can! I love biscotti, but sometimes I enjoy a nice soft and chewy cookie as well. This is what I was trying to accomplish with this cookie. I think I succeeded. Everyone loved them. Another thing I was trying to achieve was to reduce the amount of butter and sugar in the original recipe. I did this by substituting half the butter with 1/4 cup of canola oil and cutting back just a little on the white sugar. You would never know I messed with them. They came out as tasty as ever. I also came up with a few different versions of this recipe using cinnamon, nutmeg, ginger cranberries, white chocolate and apricots. But that's a whole other post! Preheat oven to 350 degrees. Mix together butter, oil, sugars, vanilla, cinnamon and eggs. Combine flour, salt and baking powder and mix into butter mixture. Mix in oats, chips and nuts. Onto a parchment lined baking sheet, spoon out mixture to form 4 logs the length of the sheet, 2 logs per baking sheet*. Leave enough space in between each log, since they will spread while cooking. Bake for about 2o-22 minutes, so that when you touch the tops they are firm and lightly brown. Remove from the oven and cool. Slice logs diagonally and decorate. Once the decorations are dry, store in an airtight container. To decorate: Just melt some semi-sweet chocolate chips and some white chocolate chips in the microwave, separately. Dip a spoon in the melted chocolate and drizzle over the cookie tops. I actually use squeeze containers because it makes it so easy to drizzle. While the chocolate is still wet, shake on some candy sprinkles. * If you want to make smaller cookies, shape into 6 logs, placing 3 logs per sheet and bake for around 12-15 minutes. I'll take a soft cookie over biscotti any day! Those look amazing, love the sprinkles too! Oh, I love biscotti. I make it all the time. This sounds good because there isn't a lot of fat. Perfect for this time of year. And oatmeal is healthy! Pork Roast...Really Good Pork Roast!